"Baby Towel features a soft and comfortable hood and each towel is made of 100% cotton loop terry wh..
"Elephant measures 8" and features big floppy ears that adds more cuteness to her look. " ..
Sherpa Blanket for BabyWrap your new bundle of joy in our cuddly Personalized Any Name Baby Sher..
"Sports Bag measures 7" x 4" x 3" and contains four sport balls for playing. The soccer ball makes a.. Custom Printed Wall Canvas can be displayed beautifully in any room, this canvas art lets anyone who.. 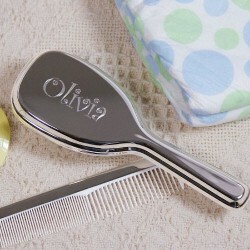 Adult Size: 24 X 30.5 Set for mother and child..
Brush measures 6” Long and Comb measures 5” Long. .. Size: MULTI 30X40 This adorable children's fleece blanket has a blue background with tiny el..